Cottage Food Laws = A Home Based Bakery for Me! Back in the ’80s, my parents gave us a subscription to Bon Appetit. A perfect gift because Ed and I both enjoy cooking and reading about new food ideas. It was a cover photo that had me making my first Swiss Meringue Buttercream. I got into fancy desserts in a big way. During this time, I was at home with our three daughters, working on my accounting degree part-time, being a room mother, Girl Scout leader and Sunday School teacher – all of the typical activities when one has school aged children. I thought about doing some dessert catering. It seemed like the perfect solution, a creative outlet that would bring in a little extra money and brighten people’s days with some amazing treats. Then I found out that it wasn’t legal to sell anything prepared in a home kitchen. Talk about bursting my bubble. Imagine my excitement last year when I stumbled upon the cottage food laws that are sweeping the nation, and yes, Arizona is a state when these laws have been enacted. The laws vary from state to state, so things I have done in AZ might not be legal in your state. For most of 2012, I’ve been day dreaming and reading about home based bakeries. The time I spent in the steam room at our gym would involve brainstorming marketing ideas. I have a long list of notes in my iPad, so putting together a business plan was relatively simple. We expect to be wrapping up our time in Poland in the coming year, so I’ve been in Arizona for the past several weeks, taking care of a lot of details for Silver Spoon: The Underground Bakery business licenses, registering with the state department of health, etc. 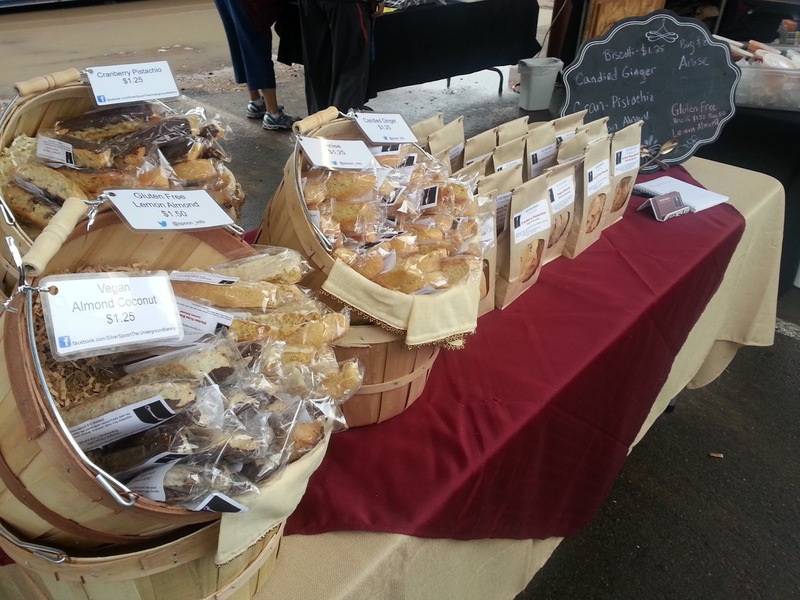 We’re keeping it simple as we start out, just offering several kinds of biscotti and selling at farmers markets. Our daughter, Lauren, has joined me in this venture and will keep things running as I head back to Poland for the summer. We’re hitting 90 degrees this week, so it’s beginning to feel like summer in the Valley of the Sun, even if it isn’t even officially spring. Currently, we’re selling at the Downtown Phoenix Public Market on Wednesday evenings and Saturday mornings. I especially like the fact that this market is run by a nonprofit. We hope to add one more market soon. I have to tell you that in the brief time we’ve been participating in the market, we’ve had a lot of fun. The other vendors are pleasant interesting people; the customers are there to have a good time and enjoy tasting and talking about the food we’ve prepared. And yes, they’ve also been buying our biscotti. The candied ginger scones I made with the ABC Bakers inspired our candied ginger biscotti. We’ve included a vegan option since we have a vegan in the family, and my friend Linda suggested a gluten free baking mix that has made our gluten free biscotti very popular. It’s still too early to tell what will be our biggest seller. Lauren and I make very good biscotti, and when you make something 4 or 5 times in one day, you get to know it really well and can tweek the recipe for the best results. We can’t compete with the biscotti sold at Costco on price, but they can’t touch us when it comes to taste! You’ll notice that biscotti isn’t mentioned in our business name. That’s because my mind is so full of ideas about twists and turns this might take as we go about “sharing our passion for good food with like-minded souls.” Besides our website (link above), you can follow us on twitter and like us on facebook to see where this adventure takes us. This is such an exciting time for you, Lois! I'm jazzed for and with you! You GO girl! Since this posted, we now have our biscotti in a coffee shop in downtown Mesa and a large corporate order. I'm honored to have our biscotti included in gift baskets made up entirely of local products going out to the clients of a Tempe firm. Thanks to all of you for helping this micro-business get off the ground!